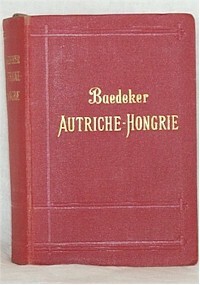 Baedeker editions in French on Germany and Austria. See also editions in German (more than one page) and English. There were not so many editions on the German-speaking countries in French, probably because of a certain froideur over matters such as Alsace and Lorraine, which suddenly became Elsass and Lothringen after the Franco-Prussian war. Despite that, it wasn't until the First World War that anti-Baedeker sentiment really set in in France - see for example Geert van Loon's Baedekeriana page. There were also two special editions on Berlin, published in 1885 and 1908 for the International Geological Congress and 12th International Press Congress, respectively.